By Andrew J. Rabe, D.O., and William E. Shiels II, D.O. 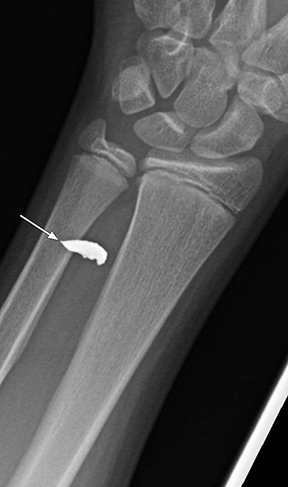 Our patient was a 13-year-old boy who presented to the emergency department with a 15 mm laceration to his left forearm that he sustained earlier in the day while “chopping wood and metal” with his father. 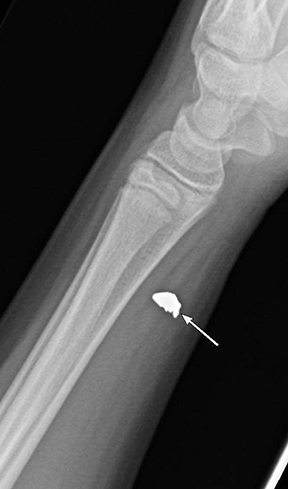 A radiograph of the forearm was obtained which demonstrated a 1.3 x 0.7 x 0.5 cm metallic foreign body (FB) within the soft tissues of the distal forearm (Fig. 1). The patient was then referred to the interventional radiology department for percutaneous removal of the foreign body. 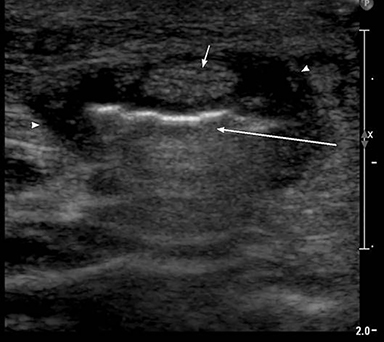 Ultrasound (US) of the area was performed in the interventional suite which showed the FB to be located within the flexor digitorum tendon sheath (Fig. 2). Under realtime US guidance, 10 ml of lidocaine HCl 1% local anesthestic was injected in the operative field to the level of the flexor digitorum tendon. Under realtime US guidance, an incision was made in the flexor digitorum tendon sheath with an 11 blade scalpel and a small forceps was introduced into the tendon sheath. With realtime US guidance, the metallic fragment was grasped and removed intact, without fragmentation or injury to the tendon. The skin wound was closed steri-strips. The patient was discharged with oral cephalexin. Soft tissue FBs are relatively common in children.1,2 Attempts at blind removal of nonpalpable FBs can be very difficult and are often unsuccessful. Surgical removal often necessitates general anesthesia as well as significant time and exploration to encounter and remove the FB. These factors contribute to unnecessary cost and potential morbidity associated with FB removal. With the development of high resolution sonographic techniques, advantages of US localization of nonradiopaque FBs such as wood and plastic have been clearly documented.1-4 Ultrasound also offers precise and real time mutiplanar guidance of instruments used for blunt tract dissection and fragment removal, preventing unnecessary injury to normal tissue. In the author’s experience, the majority of FBs are located within the superficial soft tissues and are embedded due to low velocity injuries. Occasionally, high velocity injuries are encountered which can result in FBs within deeper soft tissues including muscles, tendon sheaths, joint spaces, cartilage, bone, and the orbit. Using sonographic techniques, FBs in all of these locations have been successfully and safely removed at our institution by pediatric interventional radiologists. In certain deep tissue situations (in deep muscle compartments, within joints, or a mobile FB within an abscess cavity) US guidance is used for precise administration of local anesthesia and initial access, followed by fluoroscopic forceps guidance for FB removal. Therapeutic options for our patient are discussed below. Surgical removal would require general anesthesia, as well as an open tenotomy and procedure. Open surgical removal of FBs can be challenging, unnecessarily costly, and carries a greater risk of complications.2 Surgeons, emergency physicians, and infectious disease specialists at our institution prefer interventional radiological percutaneous image-guided removal of FBs with greater than 98% success rate (and no complications) whenever possible. Open surgical FB removal is reserved for cases in which the interventional radiologist evaluates the FB and determines the FB to be in a location that requires open surgical removal (FB behind an artery, nerve or vein, inaccessible for percutaneous FB removal). Image-guided preoperative localization can benefit the surgeon, particularly in cases of FBs which can fragment during percutaneous removal. This technique can also be advantageous when the radiologist is uncomfortable with percutaneous removal or access is limited due to FB location (i.e. adjacent to neurovascular bundle). Preoperative localization techniques include providing the surgeon with anatomic coordinates or marking the skin overlying the foreign body site.1 Precise localization of the foreign body under ultrasound guidance with a hooked-type localization wire provides excellent surgical support.1 In this situation, two wires are recommended, one placed immediately deep to each end of the FB. This technique was not chosen in this case as the patient would require two procedures, one for wire localization and a second (with general anesthesia) for open surgical FB removal. Given excellent visualization of the FB with ultrasound, safe access, and availability of pediatric interventional radiologists competent in US guided FB removal, this approach was selected. The minimally-invasive procedure was performed in an outpatient setting without sedation. The FB was removed intact without tendon injury or other complication. This unique case highlights the potential for successful percutaneous removal of an intratendinous FB in a child. Although most FBs are located within the superficial soft tissues, US guidance is an excellent modality for safe and successful FB removal in deeper soft tissues. Percutaneous FB removal by radiologists is a minimally invasive and valuable service which can obviate the need for unnecessary open surgical procedures. Shiels WE. Soft Tissue Foreign Bodies: Sonographic Diagnosis and Therapeutic Management. Ultrasound Clin North Amer 2007: 2; 669-681. Callegari L et al. Ultrasound-guided removal of foreign bodies: personal experience. Eur Radiol 2009: 19; 1273- 1279. Shiels et al. Localization and Guided Removal of Soft Tissue Foreign Bodies with Sonography. AJR 1990: 155; 1277-1281, December. Rabe AJ, Shiels WE II. Ultrasound Guided Removal of an Intratendinous Foreign Body in an Adolescent. J Am Osteopath Coll Radiol. 2012;1(3):27-29. Andrew J. Rabe, D.O., and William E. Shiels II, D.O. Dr. Rabe and Dr. Shiels work with the Department of Radiology, Nationwide Children’s Hospital, Columbus, OH.